Outside the Provincial Airways hanger at Halifax’s Stanfield International Airport, you knew right away that you were headed for a very remote location. The twin engine, British-made Islander aircraft with its oversize soft rubber tires, had just enough space for two passengers amongst the secured clutter of various freight items needed on the island. Flying in over the west spit of Sable, the grand expanse of South Beach, the dunes, the horses and the tiny weather station compound, you got the feeling of arriving at an outpost, even though mainland Nova Scotia is only 1:15 hour away. 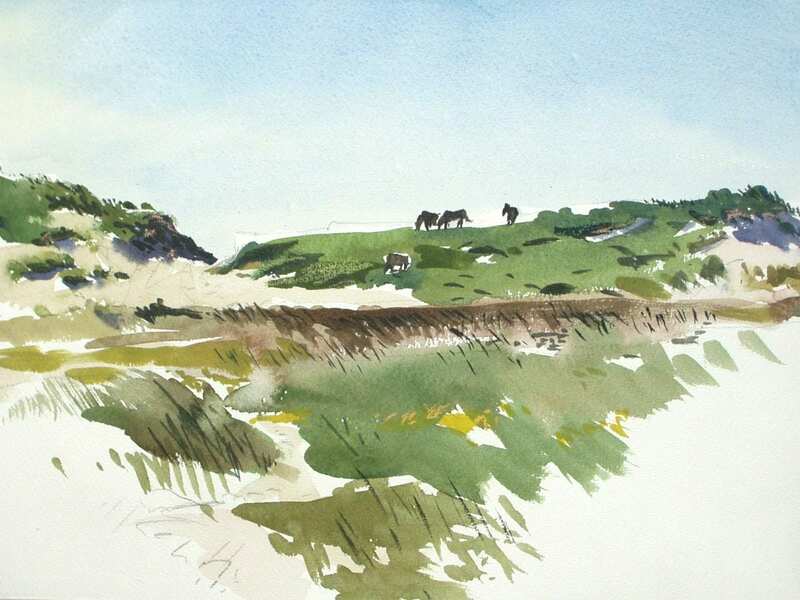 Over these 8 days in late Sept 2005, it was a delight to 100% focus on plein air painting. Two challenges I had to deal with were getting around, and the wind. I found it easier to walk along the damp, packed sand of North Beach rather than slugging it through the soft sand trails. Zoe Lucas was a great help, often giving me and my gear a lift to the E end of the island….an ATV ride of 45 minutes along South Beach, parallel to the herds of grey seals above the crashing surf. Of course you are never far away from the horses. I’d have my easel set-up and the horses would meander past, sometimes curiously sniffing my anorak and painting gear, then they’d ignore me. Their eyes are such a striking deep transparent amber colour. They were a challenge to include in my on-site motifs. Because they were often moving, I’d have to reposition my easel and then work very fast…in efficient, Zen-like brush strokes. Another element was the wind: tent pegs, guy ropes were used to stabilize my easel. Blowing sand often collected in the paint wells of my watercolour palette. Even so it was sunny, I had to wear windproof gear to stay warm. Painting at the E. end of the island, I ‘d be totally alone as Z. and I agreed on a meeting spot for pick-up later in the day. The tremendous force of Nature is evidenced everywhere. A huge bald dune that ” wanders ” depending on the winds. The ruin of the former light housekeeper’s wooden frame house had re-surfaced after a winter storm had shifted the dune in which it had been buried for years. Another striking image was a cast-iron bath tub, complete with hot & cold water taps, settled in a dune with its white enamelled top edges exposed and filled with sand. In an adjacent dune, half exposed, were the broken-up weathered hipbones, ribs of a horse. Z. showed me the skull of a walrus, complete with tusks that had recently surfaced through the shifting sands. For the return flight to the mainland, Station manager Gerry Forbes used the 4×4 pick-up to find a firm area of sand on the South Beach. “All clear” was radioed and just a short distance away was a group of horses casually observing the plane make its short taxi on the beach. Later that same month, there was a solo exhibit of all the Sable on-site paintings at my Liverpool gallery. In 2008, I donated a few of the Sable originals to the Art Gallery of Nova Scotia, Halifax.